I first heard Nick Cave in the summer of 1988, a little late given his career up to that point. Like a lot of the music I was discovering at that time it came from my roommate Steve’s record collection. I had left my grad school apartment in May but was going back frequently to visit my friends. While there Steve played Kicking Against the Pricks, a collection of cover songs. I remember liking the sound of it, but it was background music to the weekend and didn’t sink in. I left there with a cassette with Your Funeral, My Trial on one side and Tender Prey on the other. The Mercy Seat was the first Nick Cave song I really listened to. By the time Up Jumped the Devil, the second track on the album, was over I was a confirmed fan. 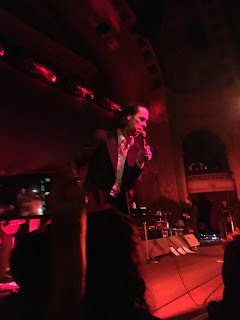 Since that time Nick Cave and the Bad Seeds have remained in the uppermost echelon of musicians I’m into. I saw him on Thursday night at the Carnegie Music Hall in Pittsburgh. While I admit that I’m riding high on the adrenaline I want to say that this was simply one of the single best concert experiences I have ever had... and I’ve been to a lot of shows. This is not the first time I’ve seen Nick, but the fifth, including his only other appearance in the Pittsburgh area with Lollapalooza in 1993. I want to talk a little bit about the specifics of this show, and then tie it in with a broader context of Nick and his work. First just let me get my complete fanboy moment out of the way. I had paid what for me is a pretty high price for this ticket. I was down close to the stage, but off to one side. 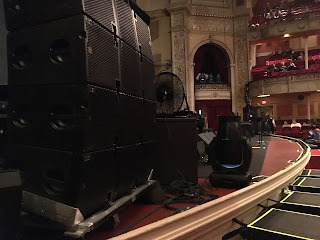 It would have been a great seat, except that speaker stacks blocked my view of about 80% of the stage. I was feeling pretty pissy about the whole thing when the concert began. Nick came out and sat in a chair at the front of the stage and performed Anthrocene. 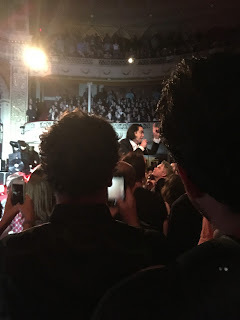 His presence was great, but I really wanted to be able to see the Bad Seeds as well. At the beginning of the second song he stalked along the front of the stage, motioning for everyone to move closer. My seat was kind of crap, so along with a lot of other people I moved. There were crates of some sort along the floor in front of the stage, allowing Nick to come even closer by standing on them. During the second song he moved to a crate right in front of me and began singing to our segment of the crowd. Next thing I knew he had leaned onto my shoulder and stretched himself out over the crowd. I stood there, one hand on his chest directly over his heart, and the other bracing his side, supporting his weight while he sang. 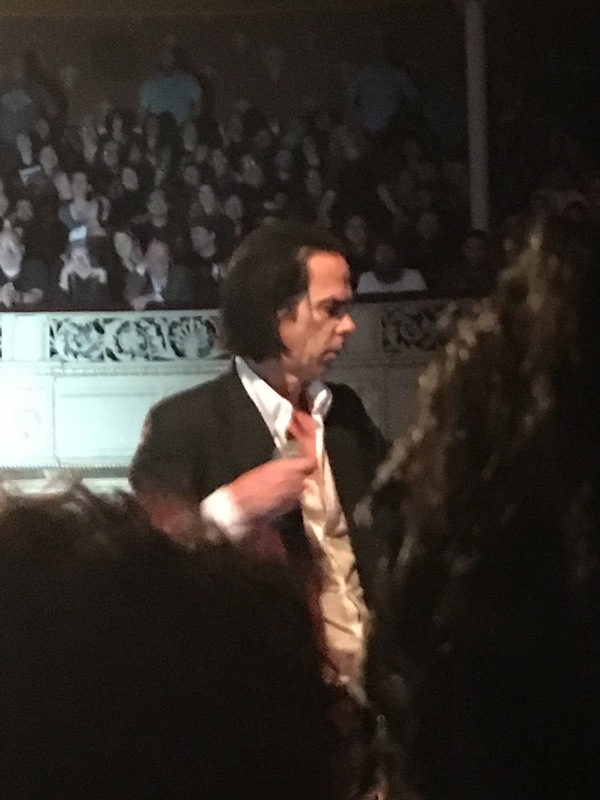 So, while I still can’t say I’ve met Nick Cave, I can say I’ve held him. I was not alone. Nick spent a lot of time in the crowd. I mean really in the crowd. He walked into the seats, and over them, held in place with the hands of many of us who were down front. It was the most intimate show of his I’ve ever seen. Nick is not a stranger to mingling with the audience. Early videos of him with his band The Birthday Party, show him completely engulfed by the small crowds, with seemingly no concern for his personal bodily boundaries or safety. This was very much in the spirit of Punk Rock confrontational theatrics. His performance style for much of his career has had the element of the confrontational to it. If not directly in people’s faces like in the early days, then certainly in terms of subject matter and intensity of performance. This fit his image as a fire and brimstone preacher of Apocalyptic visions. His image, and this was a big part of what appealed to me way back when, was that of a larger than life, mythic wandering doomsayer. He was the offspring of a world created by Johnny Cash, William Faulkner, and Manly Wade Wellman. The world he created through his lyrics and music (and his poetry and novels), was one where God and the devil were engaged in daily warfare, one populated by angels and demons, both made manifest in the actions of people and their own virtues and vices. It was dark and thunderous and dangerous, yet redemption and salvation were both possible down in the mud of our dark desires. His concerts often had the ambiance of a tent revival or a faith healing. For his fans they were both. The new show still is, but there is a difference. His interactions with the crowd were more of an embrace than an attack. He was calling people in instead of pushing them away. His approach was more confessional than confrontational. This change is not completely new. In a spoken word piece entitled The Flesh Made Word he described his own journey using the Bible as a metaphor. The early Nick was the Old Testament, frightening and judgmental wrath of God Nick, while he saw himself moving into the New Testament love and compassion of Christ Nick. Both sides are still definitely present, but the tent revival I saw this week was far more about building a community of love and support than it was about fear. There are reasons for this. Nick has been wandering in a wilderness of loss and grief recently. In 2015 his fifteen year old son Arthur fell from a cliff and died. The documentary, One More Time With Feeling, deals overtly and honestly with the aftermath of this. Nick went back to work in the studio, and Skeleton Tree, the new album, is now marinated with loss and sadness. We see Nick, his wife Susie, and Arthur’s twin brother Earl throughout, trying to move on with life in the midst of grief. I have seen and read a lot of interviews with Nick throughout the years. He has always been someone who was powerful and larger than life. He was self assured, and fiercely intelligent, and a master wordsmith. In the film he appears lost and broken, a man of words who simply can’t find any to express his new world. We see the process of recording, where Nick seems more vulnerable than ever before. His voice breaks with emotion many times, but these takes were kept for the final release. While it is a difficult film to watch it is ultimately uplifting. Nick and his family make a conscious decision to live their life, honoring Arthur and not forgetting him. The concert was this idea made flesh. He seemed happy on stage. He interacted with the crowd more than I have ever seen him do before. He bantered with people, touched them. He didn’t just come out into the crowd, he invited people into his space, allowing himself to be held by the audience, to be buoyed up by them and their love, and in return, gathered in the community he had created, he shouted his defiance to the heavens. The show itself was a mix of the new and the old, with a noticeable gap of anything from the mid 90s until the last two albums. As a long time fan, if Nick had asked me personally which of the old songs I wanted to hear, he pretty much did everything that would have been on my list. He has always been able to transition seamlessly between the furious and the funereal and this was no exception. After four of his newer, more atmospheric, but no less powerful, songs he said ‟I wanna tell you about a girl,” and launched into From Her to Eternity, and this driving song about obsession and stalking and murder brought down the house. This was followed immediately by the sound of distant thunder from the stage and I knew that we were in Tupelo. The decision to perform this song was one of the most surprising for me. It’s one of his classics and a regular feature of his concerts. But the recent details of his life has given it new context. While a lot of Skeleton Tree was written before Arthur’s death many of the lyrics seem prescient given what happened. It is impossible to listen to the album without this event infusing your interpretation of it. What is more fascinating to me is how this can now color our perceptions of his previous work as well. The lyrics of Tupelo play with the idea of how we mythologize real people, particularly modern rock stars. The song conflates Elvis with Christ, the King who will rise again. For years some people did not believe that Elvis was dead, and he was treated with a religious fervor. Elvis was a twin. His minutes-older sibling died in childbirth. The imagery of the dead twin runs throughout the song, now conveying the extra resonance of Cave’s own twin sons, one of whom is gone. In the raging elemental fury of the performance I found myself emotionally gut-punched by the new meanings of these lyrics, of which Nick has to be very aware. The final repeated refrain, changed slightly from the recorded version, of, ‟Oh mama rock your lil’ one slow, Oh mama hold your baby,” was being sung with full, lived knowledge of how easy it is to lose that child. He followed Tupelo with Jubilee Street, from the 2013 album Push the Sky Away. This song in particular felt like Nick shouting his defiance. Interspersed with the repeated refrain, ‟Look at me now,” he seemed to be addressing Death directly, speaking of his transformation, the alchemy of his loss producing gold. Former Bad Seed Blixa Bargeld is the other man in this video. He has not been with the band for many years. Into My Arms is perhaps my favorite love song. It is a paean of romance sung by a skeptic, acknowledging the one thing he can truly believe in. It echoes a lot of what lives in my head and heart and has long held a special place for me and one other. You know who you are. I can’t stress enough that although there was a lot of sad, grief-filled content to this show, it was not a dirge. It was a celebration, not just of Arthur, but of life, and love, and perhaps above all else, the idea of community and all of us taking care of each other and supporting our friends. 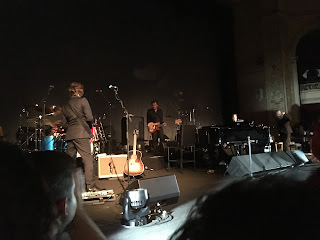 I said earlier that it seemed that Nick was inviting us into his space, breaking the barrier of the stage and audience dichotomy by joining us on the floor. This was taken to it’s logical conclusion during the final number, Push the Sky Away. Once again Nick began to gesture for the crowd to come closer, even though we were already as close to the stage as we could be. When he took a woman’s hand and helped her onto the stage, then kept gesturing, his intentions became clear. He was inviting us to join him, physically onstage. About a hundred of us did so. I stood in this crowd with Nick Cave and the Bad Seeds, an impromptu chorus, singing along with him as he closed the show with what became a hymn for everyone there. Oh but it gets you right down to your soul.